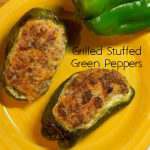 Wash the green peppers and cut in half. Remove the seeds and set aside. Brown the sausage and mix with the cheeses and garlic powder. Stuff each pepper to the top. I usually put a piece of heavy-duty foil on the grill and lay the peppers on that or you can use a Veggie Grill Basket. This helps your peppers from burning. Grill until the cheese is melted and the peppers looked cooked. Time is different for each grill.